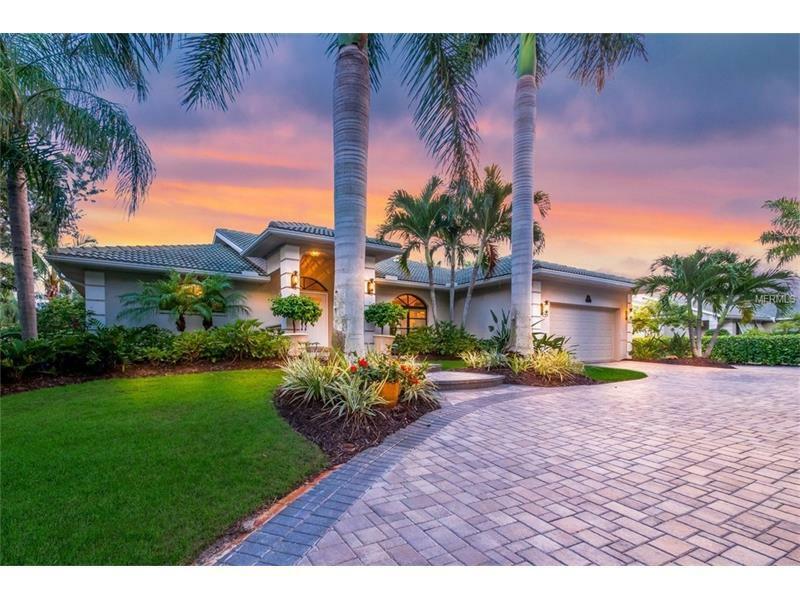 This elegant water front 3 bedroom 3.5 bath home is perfectly positioned on over half an acre. Meticulously updated in 2015 this stylish residence features porcelain tile floors throughout and 4-zoned a/c. The Kitchen living and dining rooms are combined into one spacious open design with 14 foot vaulted ceilings. The stunning kitchen is highlighted with beautiful wood cabinetry and accented by quartz counters and glass tile backsplash. Stainless steel Thermadore appliances with gas cooking. Three large bedrooms each en suite with sleek and modern bathrooms. The living space merges seamlessly into an expansive screened patio surrounding a 40â Pebble-Tec pool with 8-person spa heated with both gas and electric. This entertaining area includes a summer kitchen complete with TV mini-fridge and ice-maker. Step outside to a large backyard with gas fire pit and wood pergola all connected by paver walkways and lit by Hinckley outdoor lighting. Quick intra-coastal access from the deep-water dock with a covered 20000 lb lift and davits. Plus a gas-powered whole house generator as an added bonus. Beautifully and professionally landscaped this one level offering enjoys privacy in a lush tropical setting.